I learned of John Ryan Brubaker's work through a mutual friend, Emma Fisher, Tamarack Artisan Foundation's program director. Before I even saw the work, I was taken by the process of the work. More and more these days, I'm interested in how work is made and after learning that John Ryan used acid mine drainage as a central component of his series 'On Confluence,' I wanted to learn more. John Ryan not only shares images from the series, but also images from the field as the work was made. Now on to John Ryan's work. I asked him to introduce it and talk about his process a bit. The North Fork Blackwater River runs past Thomas, West Virginia before joining the Blackwater proper in the canyon downstream. Thomas developed as a coal town in the early 20th Century, but as the mines were abandoned they filled with water which continues to drain into the river today. The mine void currently covers 1100 acres and discharges an average of two million gallons of water per day into the North Fork. The drainage has a pH in the 3.0 – 5.0 range and contains heavy concentrations of iron and aluminum. This water dissolves heavy metals and creates acid mine drainage, which is detrimental to river ecosystems, rendering them generally unfit for life, recreation, or consumption. The works, exhibited earlier this year for the first time at the Carnegie Hall Museum Gallery in Lewisburg, West Virginia, were processed directly in river water effected by acid mine drainage and have absorbed traces of the same heavy metals and mine runoff as the North Fork Watershed itself. For the past four years I have split my time between the 500-person Appalachian town of Thomas, West Virginia and the million-person city of Brussels, Belgium. During that time the majority of my photographic work was shot and conceptualized in the urban environment and then printed and produced over the summer in my studio in Thomas. My recent projects, 'Maps for Getting Lost' and 'Every Path is Viable' deal with passageways, physical infrastructure and movement through urban space. They incorporate walking as artistic practice, GPS tracking and multi-exposure images of intersections and transit points. While considering a project based in the landscape of West Virginia I was drawn to the river as the organic, geographic equivalent to a transit grid. The lines created on the landscape by water are quite different than those carved out by public transportation and city streets, but they serve similar purposes for me artistically. They provide a fixed, finite space in which to move and observe with a camera. I chose to use the Van Dyke printing process for these works because it allowed me to work directly with the chemical nature of photography. It took months of experiments with chemistry, paper, exposure and negative density to reach the result I was after. I wanted the prints to absorb heavy metals from the water and to have a physical presence that is often lost in the presentation of photographs. A small run of the river with the ideal pH level served as my outdoor darkroom. 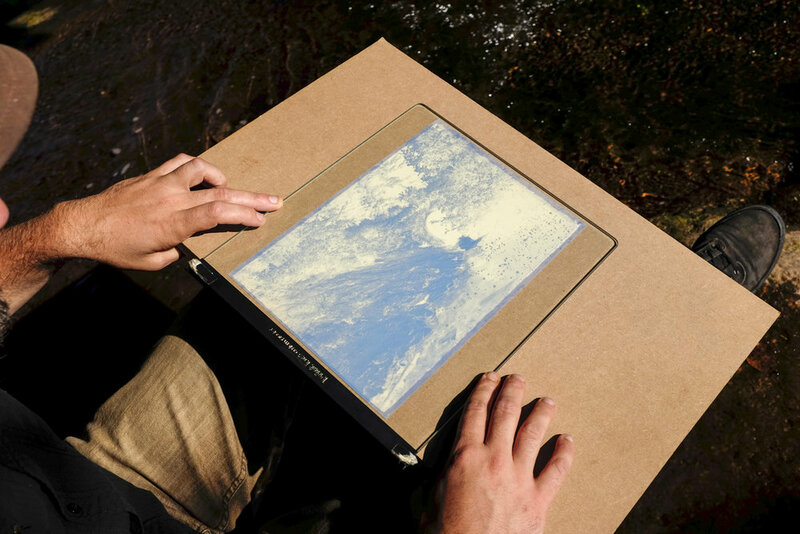 I exposed the paper using the sun and developed the images directly in the river. The prints were fixed in a solution of sodium thiosulfate, returned to the river for rinsing and then dried on the shore. I'm curious how they will behave over time, but I've embraced the possibility of them shifting in color or density as they age. They are, after all, organic objects: paper, chemistry, water and light. This project was supported by the Tamarack Artisan Foundation. It will be shown again in Thomas, WV in the Spring of 2016. You can see more of his work here and follow him on Instagram at @jrbrubaker. All images © John Ryan Brubaker and are used with permission.